The reason I keep this in my signature is to remind myself that despite my half-century of experience, I need to remember that I don’t know everything and to always expect the unexpected. While I have posted threads about extended weekend adventures and 3-day excursions, it had been since before the economic collapse of 2010 that I had actually “taken a vacation” and this would be the first time in my 35 year music industry career that I actually took a “scheduled” week off (I always sold my vacation time back). So this was going to be a big deal for me, and my family. The criteria (for me) was to be able to have cell service (in case of an emergency – with kids and in the back of my mind, I did want to be available in case something came up at work that required my attention). The challenge in the planning is that we wanted to be somewhat secluded. On the East coast, a place like this is getting harder and harder to find. I’m OCD and overly cautious — there … I said it. I’m also a Tread Lightly trainer and have had some extensive driving courses on pulling a trailer. Our trip began with our attending the Overland Expo EAST 2014 event, and from there we made a pit stop in Columbia, SC, to see my mother. 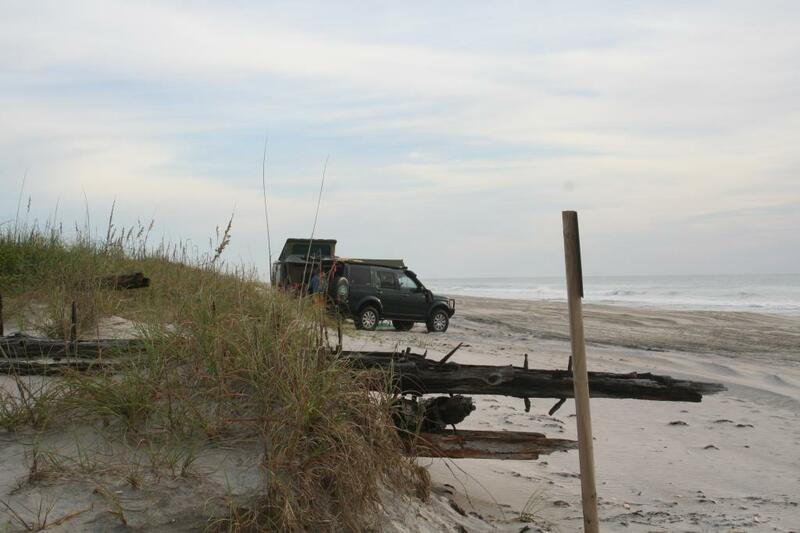 On Sunday morning, we left at 10AM to head toward Cape Lookout with an appointment with Davis Ferry at 5pm to take the last ferry ride of the day over to the beach. Even with a triple check before we left, somehow while riding down I-95, one of the doors of the trailer opened and items (without our noticing) began to be sucked out of the trailer. Several pair of expensive shoes, my wife’s and kid’s toiletries, and the cooler top to our ice chest full of ice and Coronas. By the time I noticed it, we had traveled so far that going back 15 miles resulted in no luck in finding any of the items. Turns out, poor communication between my wife and I resulted in the door being left only semi-latched. This was truly user error but only a foreshadowing of things to come. About an hour out from the ferry on US 53 (the busiest two-lane highway to the beaches in all of North Carolina), we had a terrific jolt on the left side of the truck. Luckily, instinct kicked in from some of my training and I didn’t over-correct. 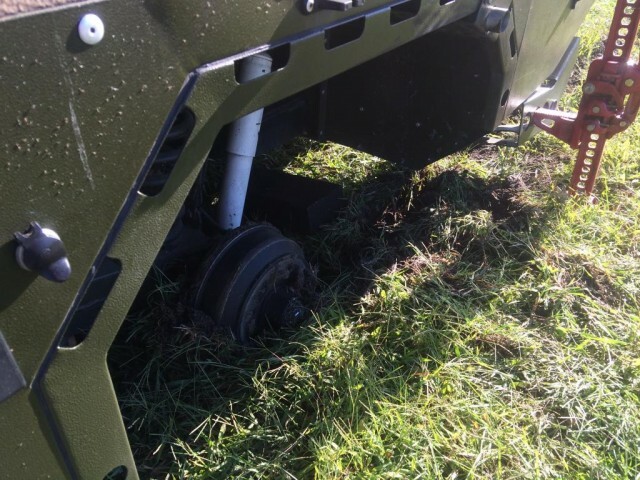 I immediately saw (and will never forget) the 32” BF Goodrich All Terrain and Land Rover wheel coming up to the side of the rear driver’s side passenger door and then shooting across the highway, hitting a slight embankment and launching 30 feet into the air. I then noticed the trailer riding the bare hub on the driver’s side, shooting a comet tail of sparks out the rear of the trailer. Unfortunately, there was nowhere immediately to pull off, as there was a drop on both sides of the road with a six-foot wide area of swampy water on each side. I was able to finally bring the truck to a stop about 300 yards down the highway. Fortunately, the wheel/tire didn’t hit anyone in the oncoming traffic lane (it would have not turned out well); and, also, no one was hurt and damage to the trailer was minimal. Upon inspection, I discovered I had lost a wheel stud. The rest of the studs on that side had some scraping, but there was no body damage or undercarriage damage (none) to the trailer. The hub kept the trailer off the ground so the hub had only some road wear but no cracks. A nearby resident saw me searching for the tire and came to our aid. He was a saint of a fellow who fetched his waders and found my tire some 400 yards out in a soybean field. 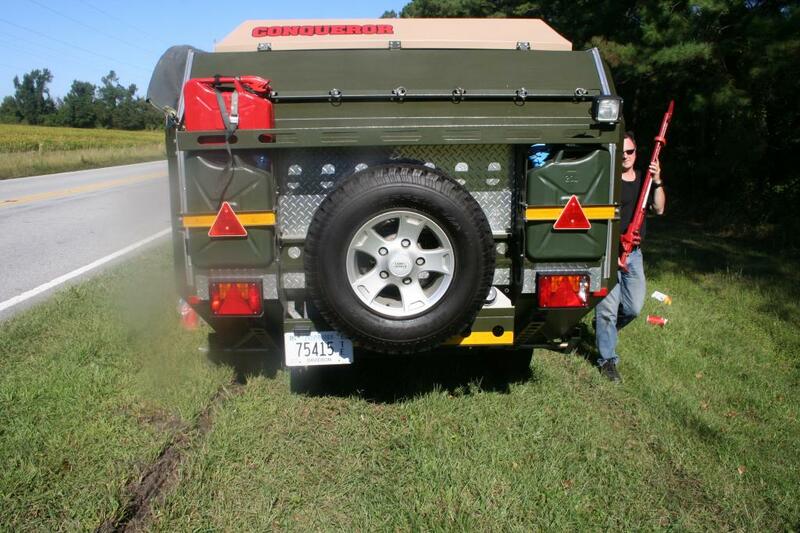 We determined that I should call Triple A (AAA), and they sent someone out, who roll-backed our trailer to the nearest tire shop on Sunday night. On Monday morning I was there when they opened, and low and behold if the tech wasn’t a transplant from England who was super enthusiastic about working on our trailer. He assessed that our studs were the short version of Land Rover studs and that we should order the long ones to eventually replace the shorts. He quickly had our threads sorted and determined we were super safe on 4 studs as long as I kept a check on the wheel at every stop. He had us back on the road in 30 minutes. The Davis Ferry Company was super sensitive to our situation and arranged passage over to the island at 2 PM on Monday. 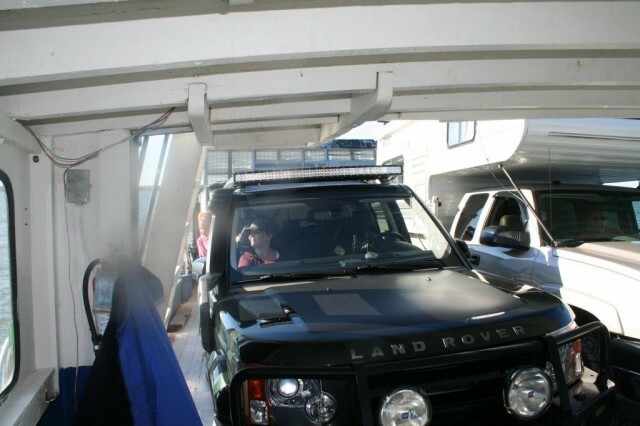 It was our first ferry ride ever, and we were excited, but somewhat nervous. We aired down from 32lbs to 20lbs and boarded. It is only a 3-mile ride out to the island. Upon arrival, we backed the trailer off the ferry, got briefed on sand driving and rules of the island, and off we went. The ride was uneventful. On the ferry ride over, there was another truck with a couple, who are on the board of an organization called DIFF (a non-profit club for people that enjoy recreational surf fishing and associated fellowship and social activities). They were super apologetic because during this particular week, there was a major DIFF fishing tournament. They seemed concerned that we would be swamped with trucks and fishermen. While we did have a stream of early morning and late afternoon trucks, it turned out to be a non-event for us, and everyone we met with the organization were top-drawer folks. 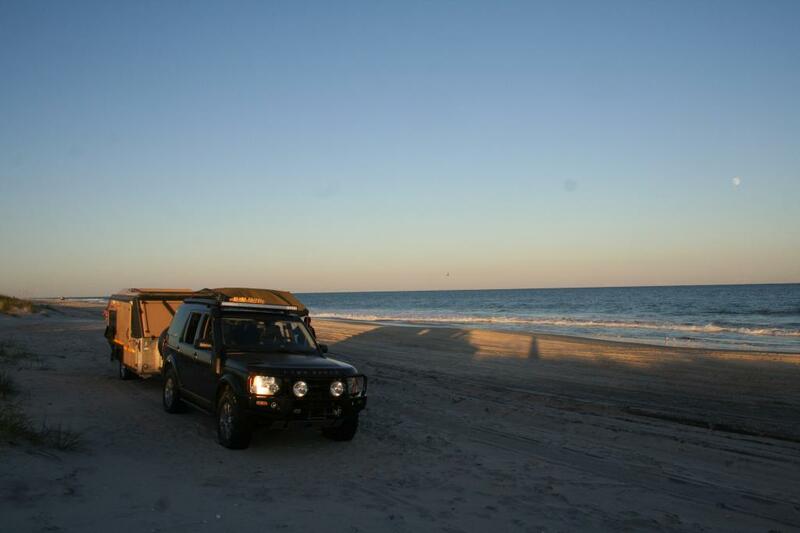 Additionally, we learned of an entirely new category of overlanding expeditions: remote surf fishing. 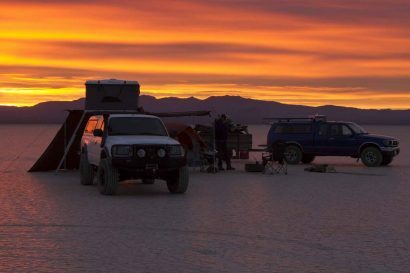 There were many different expedition rigs (all 4 wheel drive) that were set up for primitive camping and fishing. It was very exciting. 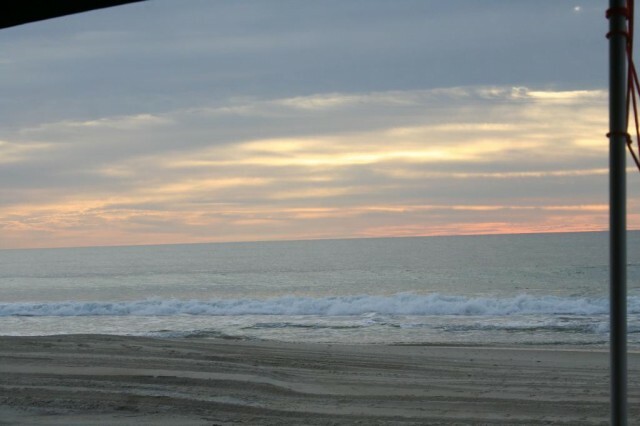 Few are the places where you can experience so much peace and tranquility with your family. The island has a Forest Ranger “hut” where you can purchase ice and emergency gas (at a premium price); but, other than that, there is no pavement on the island and the sand can be deep and rutted from other vehicular traffic. You do not come to this island without 4-wheel drive and being prepared for the possibility of becoming stuck (which we did — more on that later). 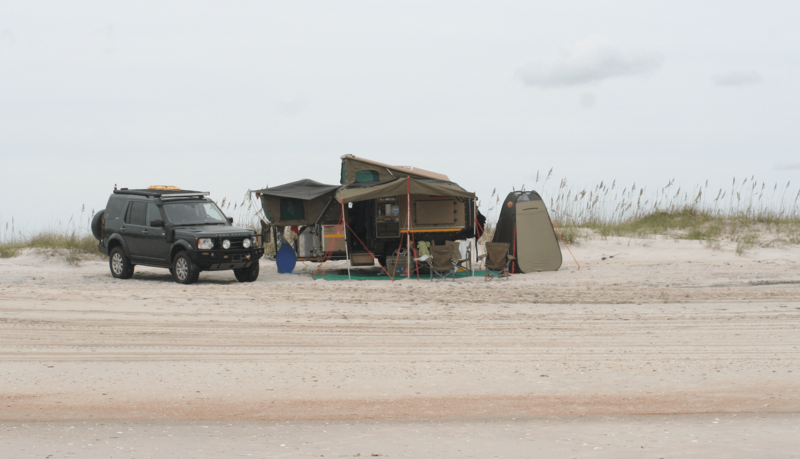 We quickly found our “base camp” for the week just in front of the dunes (but not disturbing the dunes- per the rules of the island) and 50 yards from the ocean at low tide. Yes, I would soon be falling asleep soon the constant soothing pounding of waves. The next morning I awoke to the sunrise of a lifetime. The ocean was calm, but a good breeze was blowing. We chose the place we camped because it did seem the breeze was constant. It kept the bugs at bay. The weather was cool enough to be comfortable but warm enough that the kids could play in the water. At night we required a sweatshirt to be outside and an extra blanket to sleep, but it wasn’t so cold that we were uncomfortable. My wife was resourceful enough to have prepared most of our meals in advance. She did a white chili and a red chili, for instance, and froze them in silicon bread molds. She then took the frozen bricks of chili and vacuum sealed them with our food saver. This allowed for compact filling of the National Luna and easy food prep, as we could drop the chili bricks into boiling water until they were heated. She did some stews this same way. She also baked our bacon for the trip in the oven until crisp and we vacuum sealed it. When we opened it, we threw it on the griddle to warm for a few and it was as crisp and fresh as if we had just cooked it. Because she plans the meals, pre-cooks most of them, and vacuum seals them, this saves us time, energy, and clean up. It also allows us to carry about twice the amount of food than if we were carrying the ingredients. We actually over-prepared and came home with two meals ready for the few days of post-trip recovery! 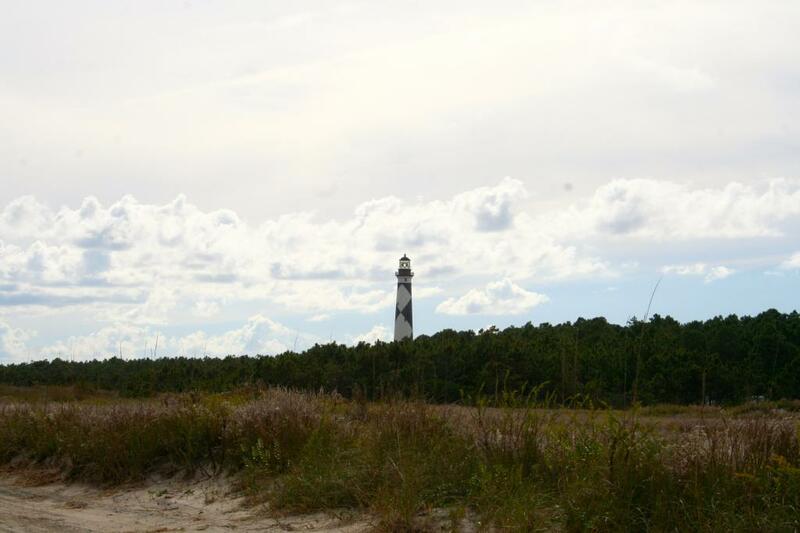 Cape Lookout also sports an historic village and an operating lighthouse that has been on the island since 1859. This was the second lighthouse to be build, as the first, built in 1812, was replaced by the current one. There were many things to explore and do on the island, but our prime objective was rest and relaxation. We explored several times out to the point of the island to hunt seashells (proclaimed one of the best places on the East coast to hunt shells) and to tour the historic homes. 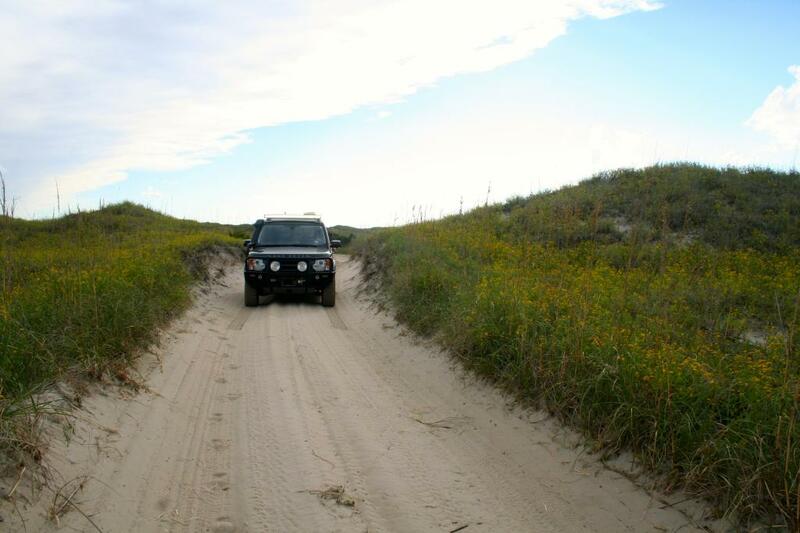 Be aware that the inland sand road is deep sand and uses more gas than if you were driving on a compacted surface or pavement. So be prepared. 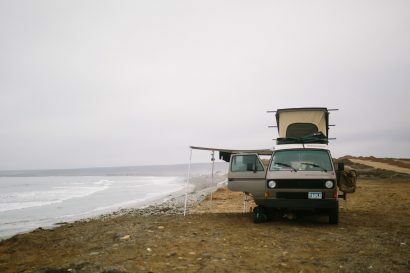 Where we camped, other than some trucks that would pass by, there were nights we could see no one in either direction up and down the beach, and a couple of nights where we could see one truck a few miles down the beach. It was as remote as you can get these days. Inevitably, that morning would come where we knew this was the last day. I started prepping for departure early, but the call of the waves and sun was so tempting that I decided to take my time. We had a 2 PM ferry appointment, and I tried to cut it close, but not too close. The kids begged for a few more minutes! 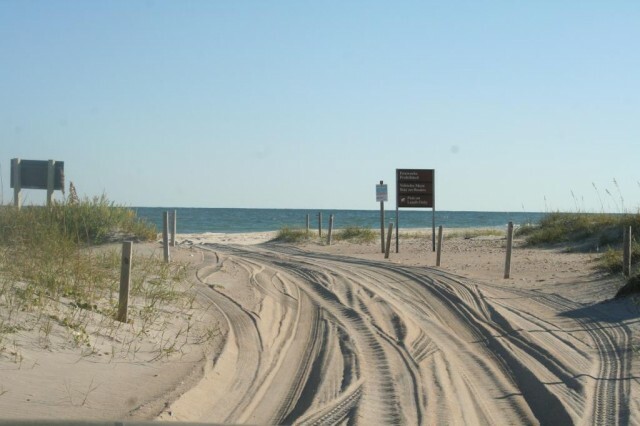 When we finally did depart, despite my knowledge of driving horizontal to the beach and making a gradual transition from loose sand to the compacted sand, I unwisely decided to try a “U-turn” so that we would be headed in the right direction. I miscalculated the depth of the ruts from truck traffic, and the nose of the trailer dipped and dug in, causing us to become stuck. I broke out the Max Tracks and started to prepare for the work necessary to recover, when out of nowhere two guys showed up in a fishing expedition rig. “We’ve admired your rig all week!” they proclaimed. “You must be headed for the 2PM ferry.” I explained that I knew better but thought I could “cheat” a little on the turn around. They parked horizontal to the front of my truck, grabbed a pre-prepared strap that they connected to their front and rear axles. Then they attached to my winch. My truck pulled their truck about 2 feet until it grabbed and I was out in 6 minutes from start to finish. I knew I could have gotten myself out with the tracks but those guys really saved the day for us. We made the ferry! The ferry captain was kind enough to allow my son to steer the ferry as we came back across the bay. It was a memorable moment for him. We aired back up and had an uneventful trip back to reality. We had a fantastic experience! We even purchased a temporary 12-day fishing license and taught the kids how to surf fish (despite not catching anything). I even tried my hand at surf fly-fishing. We were left with some sunburned legs and the knowledge that most of our unexpected troubles were user error. All the unexpected events substantiated the notion that you must be prepared for anything that can happen. It is important remain calm and flexible. Most of all, we learned that we must get out and go places more often. Cape Lookout National Seashore is now on our annual list of places to escape and explore. Dendy Jarrett is the Admin for Expedition Portal and resides in Nashville, Tennessee. 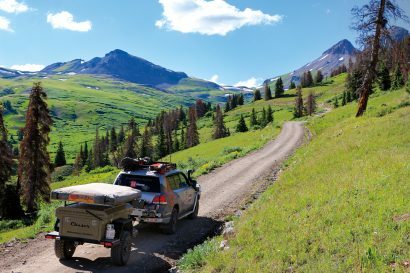 He loves getting out and exploring new remote locations and camping with his family. He is a contributing author here and an accomplished author with his other passion — music. Disaster? Grab the ditch bag. Vanajeros: First Contact, First Portraits.